Bandhani saris are made from the traditional “tie and dye” method. The word Bandhani is derived from the Sanskrit word “Bandhna” or “Bandha”. The literal meaning of it is “tied”. This method creates different attractive patterns and styles of exquisite colors in miriad ways. The process involves tying the fabric first and then dying it in one or more colors of contrasting shades. As a result, the fabric gets imprinted with different random geometrical patterns of vibrant colors on it. This technique used to create colored Bandhani saris is very old and dates back to thousands of years. Initially, this was manually done by using hands and finger nails but now with the advancement of technology, the procedure has evolved greatly to make it easier and more effective. Plastic stencils are used these days to get the desired patterns imprinted. 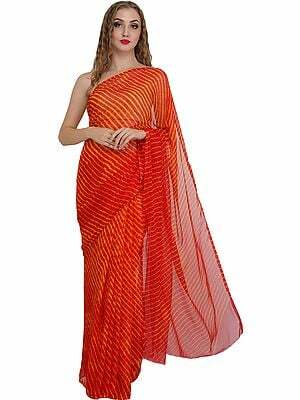 Nowadays, Bandhani saris come in countless shades and unthinkable patterns and designs. With innovative methods of manufacture, now even floral patterns amongst others are easily imprinted on the fabric. 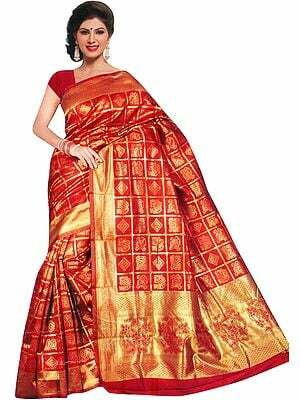 Almost all types of fabric are used in creating Bandhani saris. 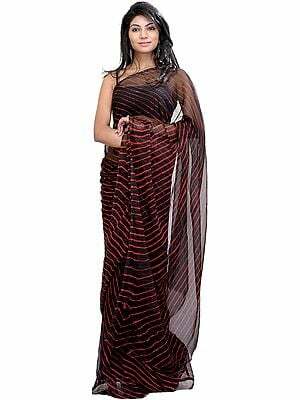 You can get one in cotton, Georgette, crepe and other fabrics as well. 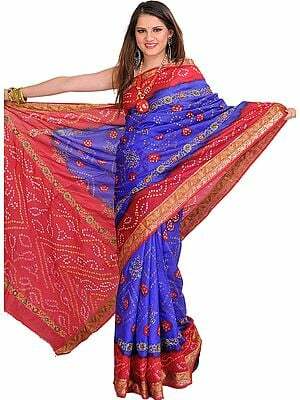 Connected with the western part of India, Bandhani saris are said to have come from the states of Rajasthan and Gujarat. Specially made by craftsmen in the Kutch Belt of Gujarat, these designs are the specialty of the Mandvi Families. Then, be it Anjar, Bhuj or even Jamnagar, the Mandvi families exhibit their Bandhani art everywhere in Gujarat. 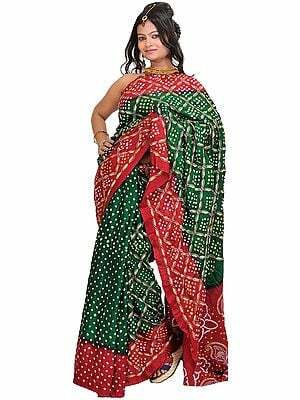 These days, other parts of Gujarat like Deesa, Porbandar, Morbi, Rajkot and Surendranagar districts are also widely known for their version of Bandhani saris. For the finest Bandhani saris one has to go all the way to the deserts of Bikaner in the Sikar district. The Bandhani saris were originally only made with contrasting shades of colors and sold. Currently, artisans create new patterns and designs with motifs and embellishments are added to the fabrics after the tie-dye process. 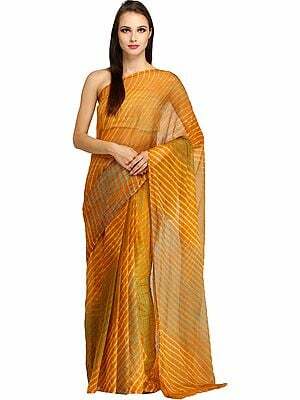 Such saris are mostly sought for by designer wear seekers and the cost of these Bandhani saris depends hugely on the patterns and designs imprinted on them. The finer the design of Bandhani sari, the steeper will be its price.Worked upon by hand, this manual technique used for coloring and printing fabric requires skilled artisans who can trace the design first and then die it by tying different parts with distinct colors at a different interval. The fabric industry involved in crafting brightly colourful Bandhani saris need creativity, time and traditional techniques along with skilled artists who are able to do it with perfection. Connected with people as auspicious prints, in India the market of Bandhani saris has always been high. 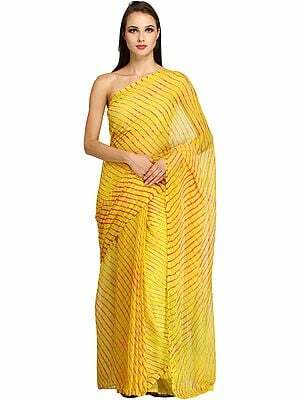 It is believed that these saris are connected with the luck of the bride where colors like yellow and red symbolize the auspicious marriage ceremony and green is associated with the fertility of a woman. Hence, every wedding in states like Gujarat and Rajasthan, does include at least a few Bandhani saris in the bridal collection. Though the fashion of alluring Bandhani saris is considered as uniquely associated with Gujarat and Rajasthan, yet states of like Punjab and Madhya Pradesh also have their own versions of Bandhani saris. The Bandhani prints produced in these states have larger and thicker motifs and patterns. Usually things like kidney beans, coins and even by pebbles are used by artisans to get a specific pattern imprinted on the fabric. South India has its own Bandhani print with dots as motifs on the fabric. The fabric used in preparing Bandhani saris is usually white and unbleached. Then, using traditional red shade known as Geru is mixed with water to create a paste. And, later with the help of pebbles, bean or coins the fabric is dyed with these shapes. Whatever may be the method, the elegance and charm of these saris are unmatched.